First of all I wanted to start by giving you a bit about myself. I rarely post on forums, and for the most part keep my opinions to myself due to caring more about having fun with what’s out there than trying to force my ideas onto people. However in rare occasions such as this I find that my desire to see something I enjoy rise above its current standing is more than my lack of caring. So now I’m here to lay my thoughts on the line hoping it resonates with what Blizzard, and the Diablo 3 community is already thinking. 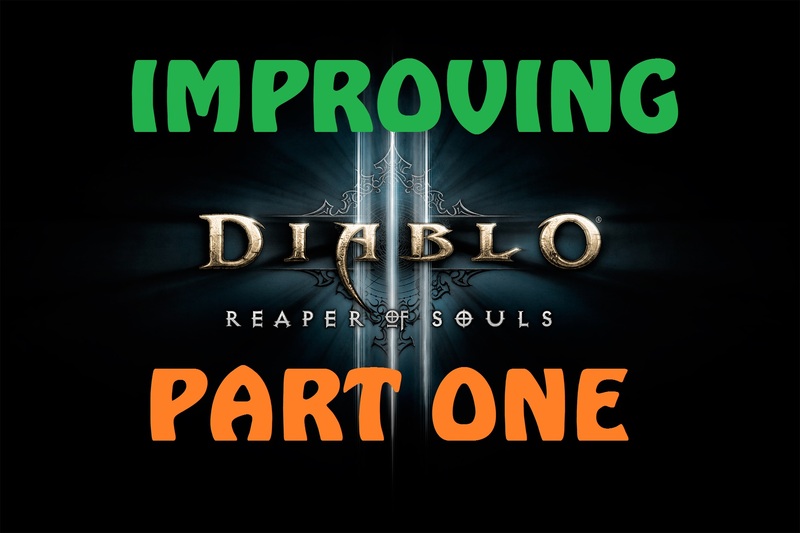 I’ve played Diablo 3 consistently from release until now and have no intention of stopping. I played Diablo original on release, PC and console. Played Diablo 2 throughout its entire life cycle (assuming the end was the release of Diablo 3) and I revoke my typical need for modesty when I say I was very knowledgeable when it comes to all three games. I say all of this so you understand my experience and the place I’m coming from when I speak of my ideas. Let’s be honest, when most people say they want more character classes, they simply aren’t saying what the actually mean. They’re just placing the most obvious word on a feeling of being bored with their current play style. At it’s base root form the statement is utterly useless. It’s more important to delve into what drives you to feel the need for another character class. The most obvious way to prove my point is to call attention to the fact that any time there is an overhaul to an existing class, or even minor tweaks to abilities, people often flock back to experience those changes. For all intents and purposes they are experiences what they wanted from a whole new character class. Basically just something different. Now that you understand what I believe the incorrect reasons are for new character classes, let’s talk about the right reasons. The main thing to be aware of is, what do you feel like you’re missing? What can no character do that you would like to see in the game? If you’re a Diablo 2 veteran and you say “I want druid!” what exactly does Druid provide in terms of physical on-screen skills that you currently aren’t being provided with? For instance, do you just want Elemental style AOE’s? Well sadly nearly every class currently fills that role as a basic need in-game mechanics. Did you want some pets? Nearly every class covers that as well. Oh you wanted to shapeshift, there are already currently 5 character altering states in the game within different classes. 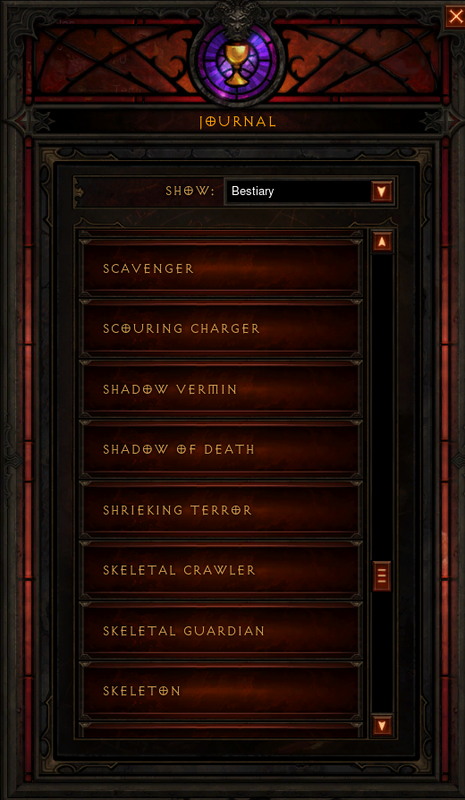 Now you probably notice I’ve added 4 additional skill slots onto the bar where the buffs bar traditionally is located. (UI issue that can be solved by adding a transparency, and toggle option for buffs.) The goal however is to illustrate that by adding a play style that gains the use of additional skills, you are able to add more utility and circumstantial effects to their casts. For this example I’ve devised what is a rough draft of the “Specialist” ability UI that you can see below. there would be huge potential. The idea being that the spell would bounce off walls and impassable terrain features, doubling back on itself while still increasing the spread of the cone. So in a situation where walls are tightly packed, this skill can serve as huge AOE and Single Target DPS. If you check the photo of the skill above you will see I also tagged out the runes available. Which would also more depth to the ability with something like “Ghost”. Which allows you to cast from a distance. Or “Sound Serpent” distorting the cone into a strafing line, with higher DPS but much less AOE. The second ability I disclosed was called “Frozen Stalactite”. This is meant to showcase another specialist focus. Which is the environment. By this I mean archetypes of terrain that can be identified without a large level of debate. Those maps can be tagged with an environment label and allow a specific set of abilities to be performed. My example for this is frozen terrain being tagged with the Environmental label “Cold”. 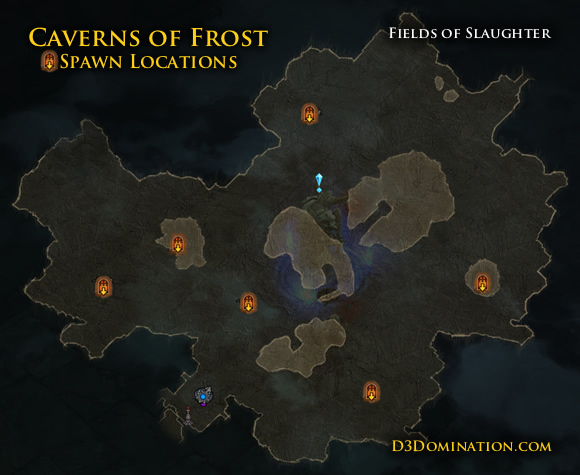 Most of these areas would be Act specific as each Act in Diablo 3 has a primary Environmental feel. In my Example I choose cold which is most associated with Act 3. This would be a unique and effective way for players to feel more in control of the abilities they choose. Rather than having a single abilities that covers their needs in all situations. Something like Frozen Stalactite would be a skill comparable to blizzard, however it would have a heavy effect in cold environments, and unusable in any other. Then the runes would also play a large role in diversifying the skill for any other. One such rune is “Chosen Dead” which would allow the spirits of Sanctuary to possess the corpse of nearby dead turning them into extremely powerful versions of themselves, for a short time. This would be meant to be a frequent cast. With corpses rising and falling very quickly. Another specialization to help break up the norm. Skills that have little to no effect on most enemies, but can be extremely useful against others. One instance of this that appeals to me is an effect that allows the map to give detailed information about nearby enemies of one type. Let’s say “undead”. 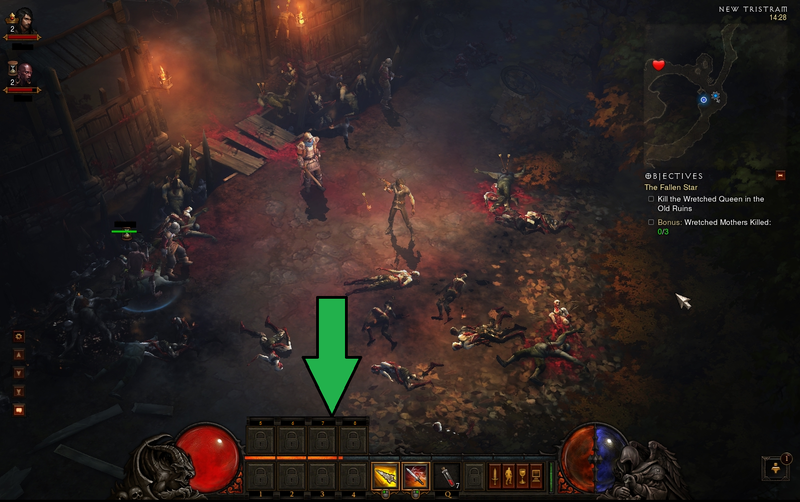 We cast an ability called “Paranormal Senses” and now the map lights up the location of undead elites within range. This would work well as a passive as well but we can get into that a bit later. The most obvious application for enemy based interactions would be a skill that deals X% damage to a target, if that target is a beast, it deals an additional Y%. Or a skill that keeps track of your total number of enemies of a single type slain, and increases damage based on that number. Which would also gives players another sense of progress, and something to gain from playing the game. obviously this would be dependent on your stories current progress, but all unlocked during adventure mode. The few I named above are just some examples I personally would have liked to fight on side with as a real follower, rather than a scripted story element. The current followers are basically stuck on one pattern. Their abilities are limited, and can be obviously chosen due to that AI pattern. I can’t tell my Templar to act more aggressive, or fall back. I have no control over when they choose to execute abilities which can often lead to poorly stacking of crowd control. Or failing to use a heal when I could have used it. Having the option to toggle into view and execute follower skills would solve this. Not to mention add a whole new layer of complexity for the players who want to step it up. I’m actually very disappointed this even has to be stated still but there is no reason I can’t hire more than one follower at a time. As someone who enjoys single player game play over multiplayer, I would love to still have more going on at a time without the dependency on a successful game community. Assuming I could do each of the advancements listed above, I would then be able to form a full party of NPC’s able to handle situations I might not have been able to on my own. This also bring back into focus the point I made about adding another level of depth and raising the skill ceiling a bit higher for players who want to take that path. This would be comparable to a games like the “Dragon Age” series where you aren’t only responsible for yourself, but for the state of your entire party. However in this case, simply not hiring followers would put you back into the single player style you know traditionally. Which bring on my last point about adventuring parties which would be, difficulty and loot as if you are in a multiplayer setting. This might have to be tweaked depending on how it plays, but the idea of not being at a strict disadvantage because I choose to play on my own and discuss the games with friends offline, seems to be inexcusable. This topic is very simple but I’m still going to spend some time beating the point with a stick because even the most simple of things can make a huge difference. and that might seem okay right? Wrong. 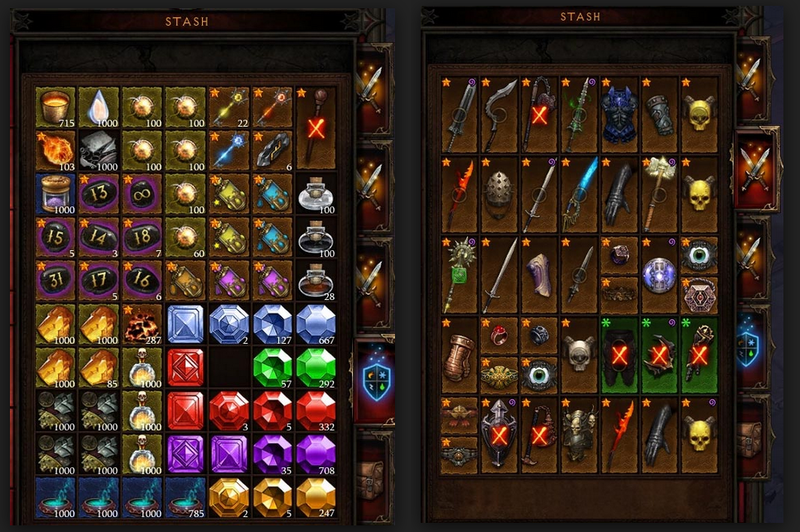 With the inclusion of additional tiers of gems, greater rift keystones, keystone of trials, and the basic crafting and enchanting materials, your stash is basically full before you even have a chance to store anything you actually want. My theory is that anything you know players basically cannot live without should be stored in an area nearly limitless and without taking up room in your personal stash. So like I stated before, this might seem like a very simple and trivial piece of the Diablo III puzzle, but in the long run it all helps to create an entertaining experience. Imagine this like an additional avenue for advancement beyond paragon levels. Filling a slightly different role, but achievement the same result. Players can count on slowly improving their character without gear based on their paragon level. Back when paragon was first introduced this was one of the most needed changes to the game and served as a beacon of light to all of us who had very high hopes for its future. This would be an entry inside your character journal. (Yes there is a journal that logs all lore content you’ve encountered) An element that right now, has no real purpose. It’s a UI feature that really helps sell the world of Sanctuary, but no one ever really sees due to its unnecessary nature. When clicking on the entry for any enemy in the game you are met with a lore entry, which you can listen to if you had missed it previously. However, that is all you can do. There is no stack tracking, you can’t see what the enemy looks like, or any unique things about them that would help to solidify them in your memory. Assuming we reach that point where each monster entry is more of learning experience, we can talk about the real feature, “Enemy Knowledge Bonuses”. For each 10,000 enemies of a specific type you kill, your damage dealt to that type will go up by 2%. Reaching up to a goal of 100,000 for an additional 20% damage against a specific monster type. Followed by a successful “Mastery” bonus after completing the full 100,000 kills on a type. Which rewards you with 15% bonus damage to elites of that type. This system can be expanded on to included features related to the current paragon system. Meaning players can be given the choice of 2% damage vs 2% armor+resists or 2% additional drop rate. Given that some monsters are more abundant than others you could even reward additional passive skills for completing enemy knowledge tasks. This is likely to be the most viewed section of this article, and quite possibly the most important. Legendary items, previously “Unique” items, have always had great appeal in a Diablo game. So much so that nearly every other RPG game since has reused this concept in their own way. Because of this the concept over extremely rare, lore enriched, powerful items has lost a lot of its charm. This isn’t something Diablo 3 has any control over. They could create all the same Legendary items you know and love from Diablo 2, with roughly the same drop rate and it still won’t appeal to you in the same way. This is due to nostalgia for your first experience with the Legendary system. Unfortunately there isn’t anything the game can do about that. The best thing they can hope to do is create new memories for items you haven’t yet encountered. With interactions you can be excited for. If you take the time to read the inscription of the Diablo 3 legendary items you can often find out more about the lore than is ever presented to you within the storyline. This gives each item a bit of history and interest. Regardless of your desire to really understand the world of Sanctuary, this allows you to really connect with, and remember an item on a level deeper than it’s stats. I’m sure most players remember the Legendary Two-handed Axe “Skorn”. But you may only remember it for it’s incredibly high critical hit damage. Making it one of the most effective weapons for a very long time. Aside from that what are the elements that draw you to an item? Most people who played the original Diablo will remember “The Butcher’s Cleaver”, “Arcane’s Valor”, and “Leoric’s Crown”. 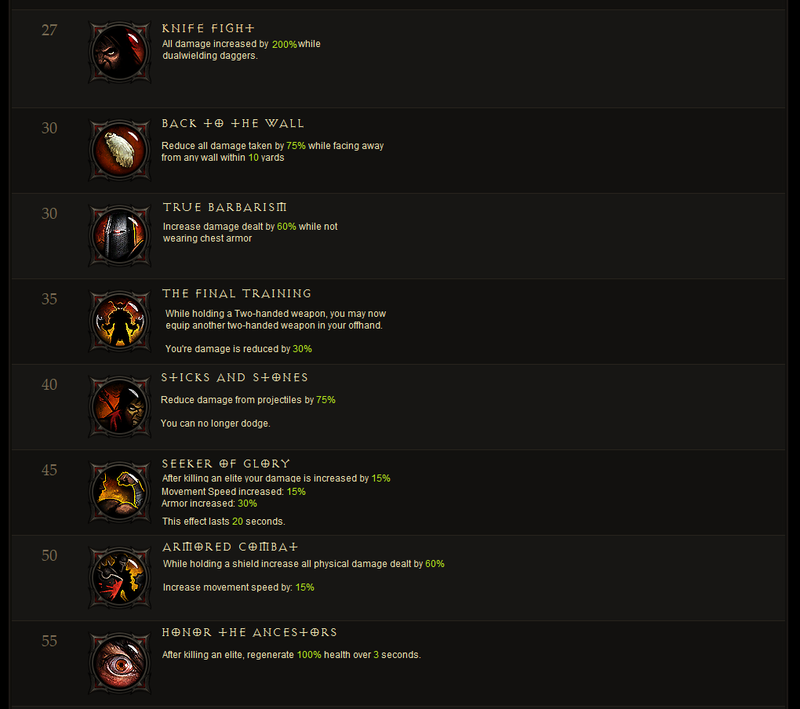 These were all items driven mostly by Lore than hard stats, yet they’re the ones I remember most fondly. In Diablo 3 there are a few instances of this, but none of them are seen frequently enough to make an impression. The lower levels are a perfect time to introduce items that we can really latch on to. I have very good memories of playing Diablo 2 and almost always finding a unique item within the first 5 levels, and because the amount was fairly limited, it was always something I recognized and enjoyed seeing. This may seem cryptic at first, but it’s actually fairly obvious. When you bring the item to a certain location, it transforms into something better. Imagine the location to be any dungeon in the game. Could be a more rare dungeon spawn, or a fairly common one. But the only way to check is to go to those locations and find out! After entering the correct dungeon, an ancestor’s spirit appears before you and explains the history of the compass. Perhaps something specific to the Monk homeland. Imagine then that you are then forced to fight this spirit, whose abilities and stats are that of a highly geared Monk class. After defeating the spirit he discloses that you are worthy of the compass’ strength and his spirit will now possess and remain within the item. Accompanying you along your journey to rid the world of evil. You then are awarded with the “Ascended” Ancestor’s Compass. who’s stats, magic properties, and legendary affects all exceed the previous version. Each Compass would spawn with a tag to a different dungeon making each item a whole new quest of its own. This is what I mean about items that tell a story. You can now discuss the items with friends, and about how your time was trying to ascend it. 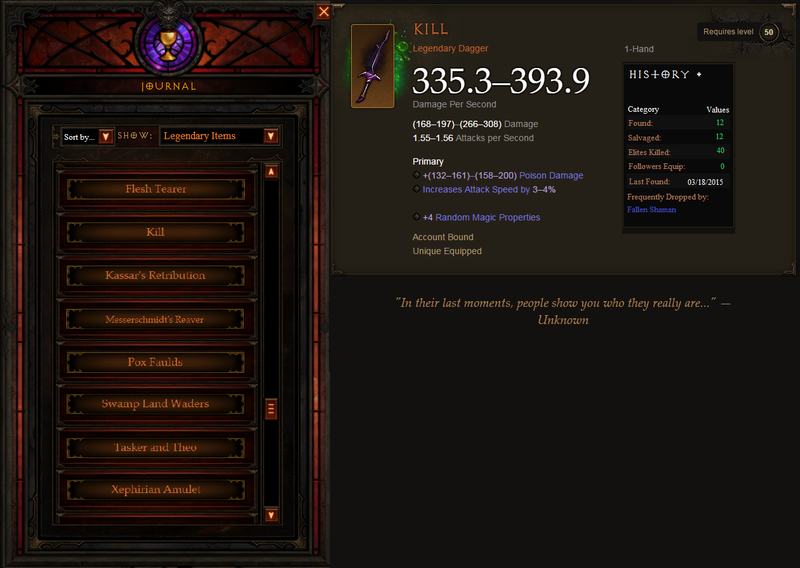 These create memories you can really recall when thinking about the Legendary items of Diablo 3. Not about the stats of an item, but about the gameplay stories they allow you to tell afterwards. I will hand it to Blizzard, “Ancient” legendary items were a step in the right direction, however it was more like a squirrel crossing the road. They had a very good start, but it seems like they got freaked out half way and chose to back down on their ideas. 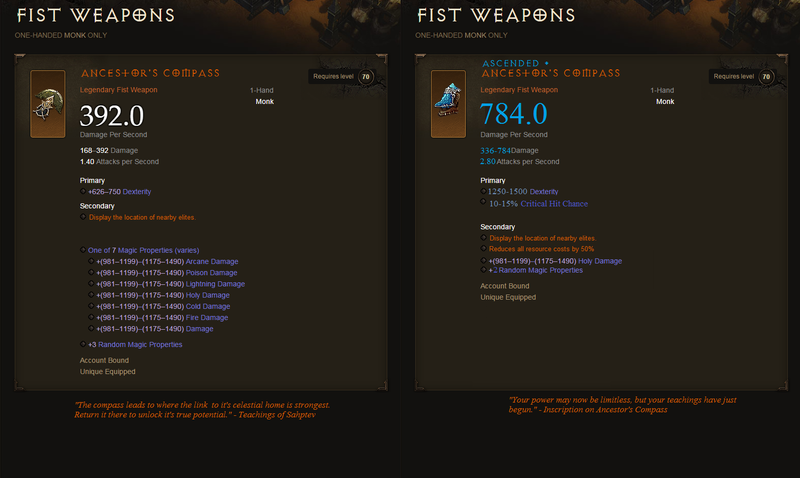 Which made ancient legendary items become nothing more than a physical damage boost, with nothing more to it. Cursed – Items with cons. Having extreme potential in some aspects, but place risks in another. For example: Health Reduced 50%, Cannot regenerate resources. Intelligent – Gain power based on achievement progress. Paradox – Is not Unique equipped legendary. Ascended – Gain power through completion of a task. Hated – Gain power through killing specific foes. Ethereal (The return of) – Increased power, cannot be repaired. Those are just a few of the Legendary attributes I’d like to see applied to existing legendary items. This would give a larger scope to what an items potential could be, Not to mention increase the desire to identify legendary items even after knowing what they are. 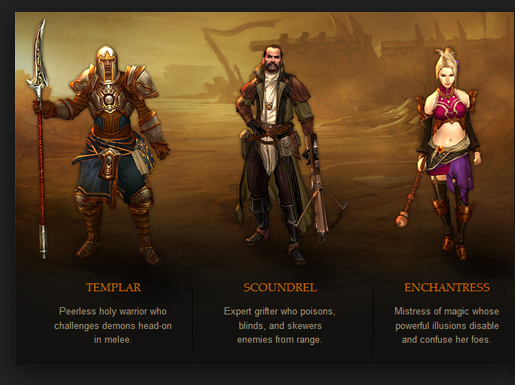 Finding any legendary with these attributes would make them better, so no matter which you role it’s a pleasant sight. Some of which obviously more sought after than others. Now that I think you understand what i mean with additional attributes we can move on to the actual design of the items. Having specific affix’s will allow players to not only remember and connect with the items, but also allow for plotting out what works for your characters desire. 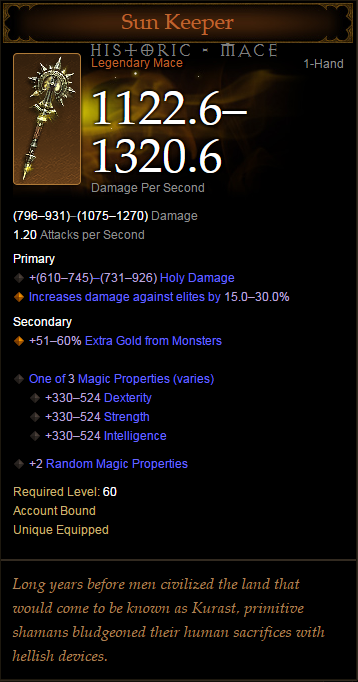 The fact that the Diablo 3 build went for less legendary items total, but more random stats to make them feel different is a horrific cop-out. They succeeded in delivering the illusion of item content without actually giving different items. Now taking a small step away from the actual design of the items and towards another element that makes them exciting. We all know that most players love stats. The more tracking you have on a specific element the better. Achievements cover the intention of this topic in a moderate way, but not to the extent it should be taken. Another UI feature needs to be implemented that keeps track of your Legendary Item finds. Displaying the number of times found, a brief lore of the item, it’s stats, and in-game graphic. This can be used to imagine a new character build through your journal. Rather than browsing the internet. Eliminating time spent “alt+tabbed” viewing information about the game not currently available within the UI. Here is an example of the Legendary Item journal entries. You can see in this journal entry that this UI system is pretty minimal to the overall appeal of the game, but greatly improves on the user-friendly nature of the game. Being able to go back and review your previous discoveries, knowing that somewhere it is being recorded, makes for a more rewarding time looting monsters. This can be cause for a lot of controversy due to its ability to trivialize one type of monster while empowering another. However as I mentioned before, this isn’t the place to talk risk, and balance. That being said let’s continuing discussing Monster Specific Drops. This system is defined by allowing a type of monster to be more likely to drop loot of a certain category over any other. Meaning, if you want to find armor pieces such as boots, gloves, shoulders, you would go to Act 1 and farm the monsters there. If you wanted to find weapons, you could farm the monsters in acts 4 or 5. I’m sure you can see where I’m going from here. Now obviously this system is intended to work more effectively in the adventure mode environment where you have the ability to jump from Act to Act at your discretion. During the initial campaign version of the game, monsters would have the standard random drop loot table. This is intended to give players more control over the items they are trying to obtain. Not making it “easy” to obtain the rarest items. But allowing players to feel like it’s their knowledge, and choices that effect their characters progression, not a random numbers system. Below is the UI table to be located in the journal displaying the item categories with their likely drop sources. This also includes a monster type more likely to drop the base item. 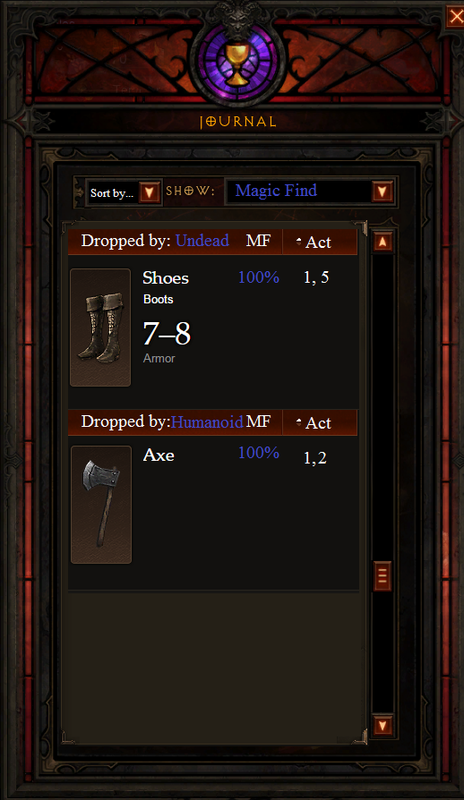 In the case of the boots, you have an additional 100% Magic Find when killing Undead, in acts 1 or 5. This applies only to the discovery of boots. The same idea can be applied to the axe, and every other item type. This system has been expressly shied away from in these sorts of action RPGs. The premise being that the more time you have to spend searching for gear, the more likely you are to continue playing. I believe that is a very outdated way of looking at gaming. Nowadays most people would prefer to gain their gear reasonably quickly, but have more ways to show it off. Whether it’s through difficult PVE, or competitive PVP. The real excitement comes from plotting out what you intent to have during your endgame romp, and actually being able to achieve that goal in a reasonable time. Once again this is a system that can be expanded indefinitely to include exciting drops from extremely rare monsters. This specific inclusion is what we will be discussing next. 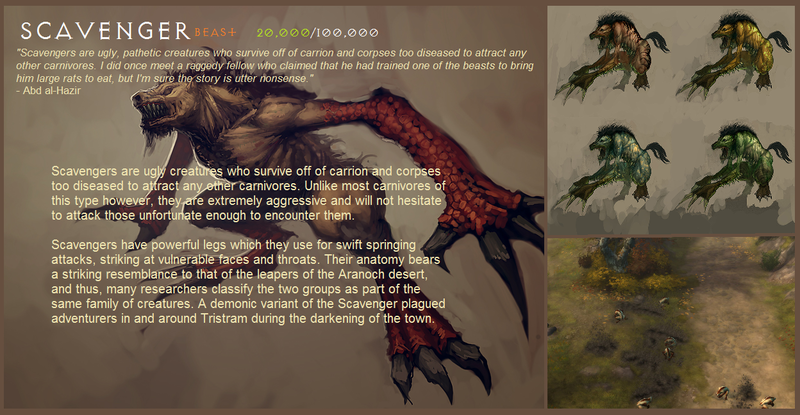 One of the most disappointing things in the Diablo 3 game was how, for lack of better words, “common” the unique monsters were. There weren’t really any unique monsters that stood out to me due to the fact that there were so many of them. Their spawn was extremely frequent, and they dropped loot not even worthy of staying on-screen long enough to check out. This is a problem. It appears blizzard had also realized this issue and began to fix it with the introduction of “Keywardens”. despite them being a monster for a specific intention, they were still interesting, fun encounters. With worthwhile loot. When in an area that included a keywarden I found myself constantly trying to seek them out. This system was implemented extremely well, and more like it should be evident throughout the game. Less frequent spawn for Unique monsters, with exceptionally high potential for loot would make then feel special and actually stand out in the crowd of enemies. Giving people a reason to wander through a zone, checking spawn locations, and hoping for the encounter with whichever Unique monster resides in that zone! There are quite a few other thoughts I’ve had on the matter but instead of continuing to state them, I’d rather leave it here and allow the thoughts to generate some feedback. So instead I’m going to end with a slightly less In-Game focus and discuss something a bit more philosophical. This is something I’ve briefly gone over in a few circumstances and feel it’s more than necessary to bring it up here. Effectively the point is that despite how big your dream is for a game, it’s never big enough. It’s the responsibility of the publishers to look out for the financials, it’s the developers responsibility to make the best of the guidelines they’re given. But it’s the responsibility of the fans, and the consumers to give our most honest opinion of the effort that were achieved within that confine. The feedback and support, or lack of, is the final judge of the gaming worlds efforts. Without our honest critique of their product there can be no change. Accept your responsibility as a gamer and state your opinion. Compromise to no one in your highest expectations when receiving a product, because you can bet that the development team supports you, and wishes they were allotted the time and finances to make a product they can forever stand behind. And with that, I’ll leave you for now and in reading this I hope you’ve opened your mind to the possibilities that still lay before us.